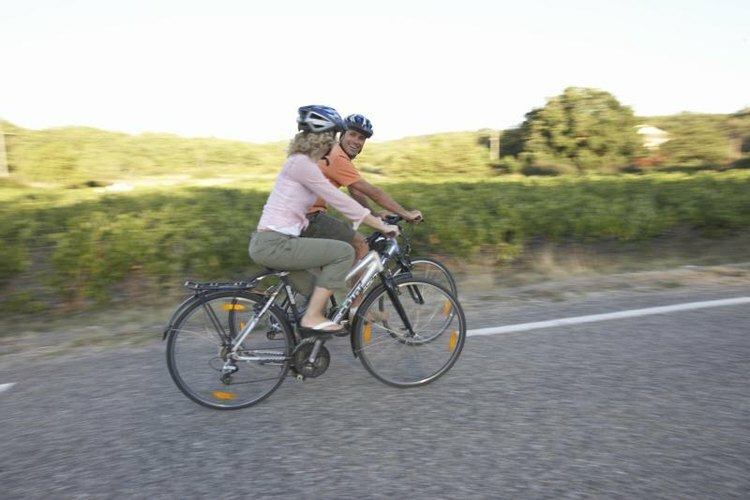 Two adults riding their bikes on the side of the road. For adults who want to learn how to ride bicycles, getting onto a bike for the first time can be as intimidating as learning how to drive. They need patient guidance from an experienced friend or family member. However, if you’ve been asked to teach someone, take it slowly. Learning to ride a bike is not a matter of shoving someone onto a roadway and making them do the bicycling equivalent of sink-or-swim. You have to take it in stages, gradually building up the learner’s skills and comfort level. Before learning to ride, an adult must learn how to prepare to ride. Have the adult wear a helmet, even if local laws don’t require it. The rider will wear shoes that aren’t going to fall off, with the shoelaces tucked inside the shoes. Pant legs need to be either tucked into socks or secured with straps. If the shoelaces or pant legs are loose, they could get tangled up with the bike chain. Gloves, elbow pads and knee pads can also give the rider more protection, though these items are optional. Let the rider sit on the bike and get used to where all the parts are. Have the rider check out the brake handles and shifter location, even if these parts aren’t going to be used for a while. The rider should practice squeezing both brake handles to get used to how the brakes work. Keep the seat of the bike low enough so that the rider’s feet touch the ground and so that the handlebars are higher than the seat. The rider should be able to sit upright on the bike -- don’t make a new rider hop on a racing bike with dropped handlebars because those will be harder for a newbie to use. Even mountain bike bars, which run straight across, can be tougher to balance. A common method for getting an adult used to how to balance on a bike is to have her sit on the bike in an open parking lot or lawn that has a very slight decline. Have her start to scoot the bike forward using her feet; she should try to raise her feet up a little and eventually place her feet on the pedals in order to coast. Let the rider know that slow-moving bikes are harder to balance on, so a little speed is better -- but nothing too advanced. Have the rider practice coasting and balancing -- and braking -- until she’s comfortable with that. Some bike organizations, such as the International Bicycle Fund, suggest removing the pedals at this stage, but that’s up to you and the rider. Leave them on if the rider is comfortable with them on the bike. Once coasting becomes easier, have the rider practice moving the pedal on his dominant side to the top of the circle formed by the pedals. For most people, this will be on the right side. With you holding the saddle lightly, have the rider practice pushing down with the dominant foot and moving the other foot onto the other pedal. Once the rider is comfortable with taking off, it’s time to have them actually pedal somewhere. Lightly hold onto the back of the seat to help them balance. When you think they’re balancing relatively well, try letting go. This can take a few tries, so both you and the rider shouldn’t be frustrated if you have to keep trying. Once the rider masters riding in a straight line, practice shallow turns so that the rider can get used to leaning in slightly and then straightening up. Move on to U-turns, checking clearance to the side and behind when turning, and shifting as the rider becomes more comfortable on the bike.